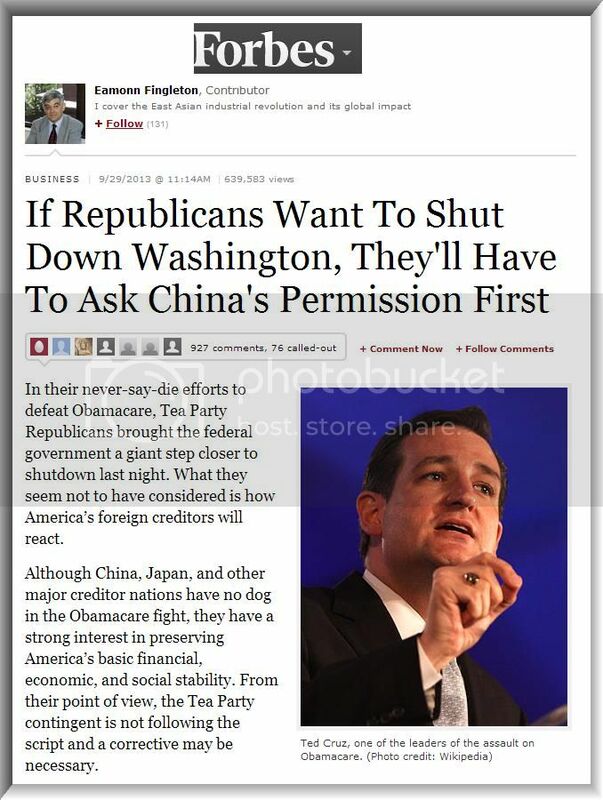 Tea Party Says Government Must ShutDown! AND THE WINNER IS: NOBODY! The Tea Party Congress has failed us again just to get its own way. 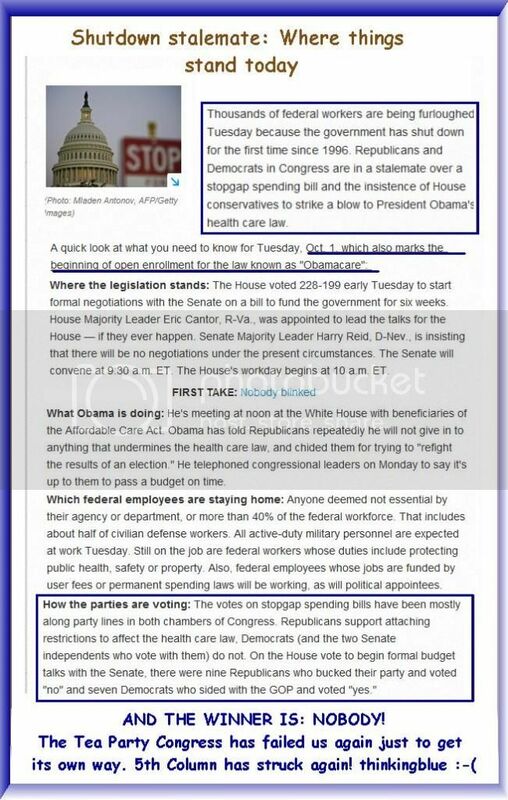 October 1st 2013 The Day The Tea Party has spoken, ordering an American Government shutdown! If the creditor nations were to sell just a small proportion of their American assets, they could send Wall Street into a tailspin, with unpleasant implications for the net worth of many Republicans. They are unlikely to push things that far but even if they were merely to slow the pace of their buying, bond yields would rocket and stocks could fall 15 percent in the space of a couple of weeks. A key thing here is that American asset valuations are at historic highs  the Standard & Poors 500 is on a P/E of 19 and long-term bond yields are still near their lowest in decades. It is sometimes suggested that by triggering a sell-off, creditor nations would be cutting their own throats. Actually this is a characteristically myopic Western way of looking at things  a view that completely misunderstands how things have changed now that East Asians call the tune. The creditor nations are long-term holders who are largely indifferent to short-term fluctuations. As a general rule, East Asians hate drawing attention to themselves. But they are quite effective behind the scenes. One of the most important ways they wield influence is through major Wall Street investment banks, which by no coincidence are openly hostile to the Tea Partys latest gambit. Wall Street banks spend large amounts on political contributions, typically backing both Republicans and Democrats. Their money gives them plenty of face time to advise American elected representatives on good economics, a term that more and more these days amounts to economics that serves East Asias interests. Meanwhile American investors generally are short-term thinkers who rarely show much intestinal fortitude in riding out market downturns. It remains to be seen how markets will react tomorrow but the betting is that, in the absence of a climbdown by Republicans, we will see a significant correction. And if Tea Party stalwarts continue to stick by their guns in the weeks ahead, we could see damage particularly in techs and other high P/E stocks. For the record, major tech stocks that seem most richly valued on a forward P/E basis include CRM, LNKD, CCI, FB, and ADBE. Although future prospects may justify such valuations, the short-term action could be quite bumpy  certainly bumpy enough to frighten a lot of the Republican rank and file.